In case you were wondering why I'm late in posting a new recipe, it's because school has started again and so has my crazy weekend schedule. Imagine you're being asked to write a paper about your company's strategy and how decisions are made in your organization. Now imagine your job is not allowing you disclose any of these information outside of the company. How do you get to fill up those 4 pages now? I just can't wait for the next year and a half to fast forward so I can start doing everything that's fun. I have a list already which might not look fun to most people. Get a part time job at a restaurant, or maybe start to teach part time. The list is long, and I don't want to take your time reading my complaints. So let's get to what's interesting. If I ever decided to go vegan or vegetarian, I could really live off of adas polo (after kadoo polow off course). This version of adas polow is the simplest version, there are other versions which include ground beef, raisins and all sort of goodness. But I thought I should start with something simple. If you feel you need to have something with your adas polow, you can have it with fried eggs or saffron chicken. 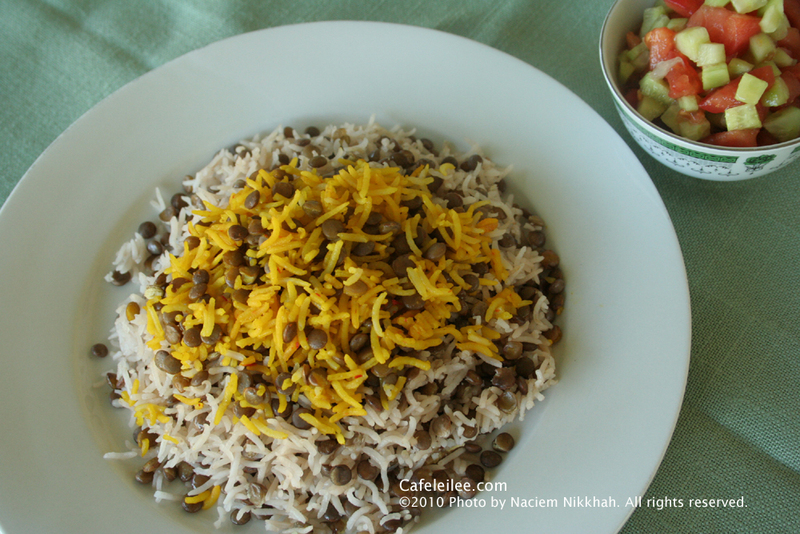 Place the rice and lentils in a large bowl and cover with water. Agitate gently with your hand and avoid breaking the rice grains, and then pour off the water. Repeat this 3 to 4 times until the rice is completely clean. Soak the rice and lentils with water and salt for 2 to 4 hours. Add water to a large pot and bring it to a boil. Add the drained rice to the pot. Boil for 6 to 8 minutes, gently stirring with a slotted spatula. The rice must grow and cook, but not overcook. Bite a few grains to test the rice. Drain the rice in a large, fine-mesh colander. Make sure there is no grain of rice left in the pot. Put the pot on the stove top again and increase the heat until the bottom of the pot is dry. Add ¼ cup of vegetable oil, and let the oil get hot. Take one spatula full of drained rice and lentils at a time and gently place it in the pot, and shape the rice into a pyramid as you go. Poke 4 or 5 holes in the rice pyramid with the handle of the spatula. Add the butter and remaining 2 tablespoons of oil over the rice. Place a dish towel or 3 layers of paper towel over pot and firmly cover the pot with its lid and reduce the heat to low. Cook for 40 minutes. 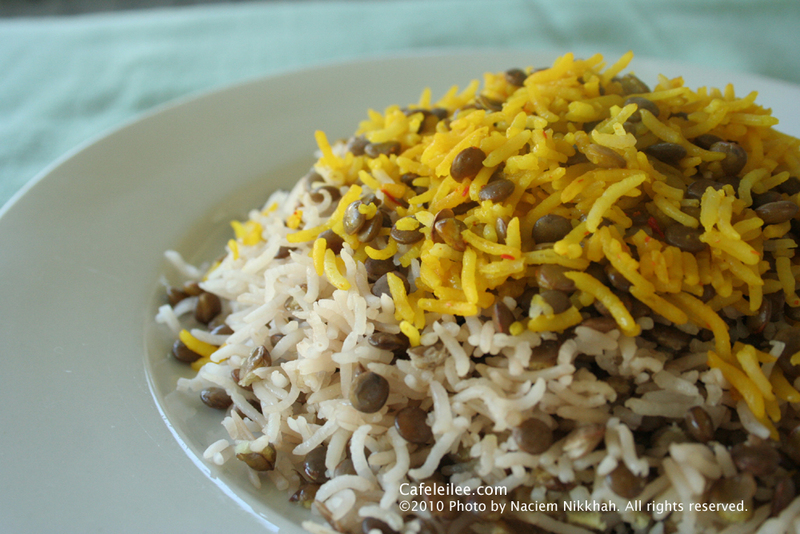 To serve, In a bowl, mix 1 spatula of rice with the saffron liquid and set aside. Using spatula place rice on a serving platter without touching the crust. Mound rice in shape of a pyramid. When you have transferred all the rice to the serving platter, spread the saffron rice over it. Then remove the crust and place it on another dish and serve on side. احیانا اگر فکر کردین که من این همه روز کجا غیبم زده بود، باید بگم که دانشگاه دوباره شروع شده و همچنین آخر هفته های شلوغ و پر از برنامه من. نمیخوام سرتون رو با شکایتهای دانشگاه درد بیارم پس بریم سر اصل مطلب. روش های زیادی برای پخت عدس پلو وجود داره، مثل عدس پلو با گوشت چرخ کرده و کشمش و کلی چیزهای خوشمزه دیگه. ولی این روش ساده ترین روش هست و من هم برای همین تصمیم گرفتم از آسونها شروع کنم که خواننده های غیر ایرانی بتونن یواش یواش با انواع پلو های ایرانی آشنا بشن. اگر دلتون میخواد که در کنار عدس پلوتون یک غذای دیگه هم باشه، پیشنهاد میکنم که با تخم مرغ نیمرو شده یا مرغ زعفرانی سروش کنین. راستی، دو روز پیش متوجه شدم که یادم رفته بود مقدار آرد برای کیک پرچم رو پست کنم، یعنی تو این همه مدت هیچ کس سعی نکرده این کیک رو درست کنه؟ واقعا که نمیدونین چی رو دارین از دست میدین. برنج و عدس را توی یک کاسه بزرگ بریزید و چند بار با آب بشویید. آب و نمک را به برنج و عدس اضافه کنید و بگذارید تا برای ۲ تا ۴ ساعت خیس بخورد. یک قابلمه بزرگ را پر از آب کنید و روی حرارت زیاد جوش بیاورید. آب برنج را خالی کنید و برنج و عدس را توی آب جوش بریزید. بگذارید برنج بپزد ولی مواظب باشد که زیاد نپزد تا برنج یا عدس له شود. برنج و عدس را آبکش کنید و مطمئن باشد که همه برنج را از قابلمه خارج کنید. قابلمه را دوباره روی حرارت زیاد بگذارید تا آب آن کاملا کشیده شود. ۴/۱ پیمانه روغن مایع را به قابلمه اضافه کنید و بگذارید روغن داغ شود. برنج را به قابلمه اضافه کنید و شکل یک هرم در بیاورید. با ته کفگیر چند جای برنج را سوراخ کنید. کره و باقی روغن مایع را روی برنج بریزید. روی قابلمه را با یک حوله تمیز یا ۳ لایه کاغذ حوله ای بپوشانید و با در قابلمه خوب سفت کنید. حرارت را ملایم کنید و بگذارید برنج برای حدود ۴۰ دقیقه دم بکشد.